This study examines the effectiveness of neighborhood councils in Los Angeles, a significant institutional innovation in urban governance. The study considers NC boards as a dynamic and open social system that interacts with NCs’ internal and external environment. We propose that three factors—internal capacity, external networking, and attention-action congruence—are related to NC effectiveness. The findings from a questionnaire survey of 80 NCs show that NC leaders perceive their organizations to be moderately effective. While internal capacity contributes to all three dimensions of effectiveness, external networking enhances NCs’ effectiveness in solving community issues and advising about city policies. Attention-action congruence, which examines the correspondence between NC board members’ issue orientation and actual actions, is positively related to NCs’ effectiveness in advising about city policies. The study concludes with implications on how to viably enhance NCs’ effectiveness. 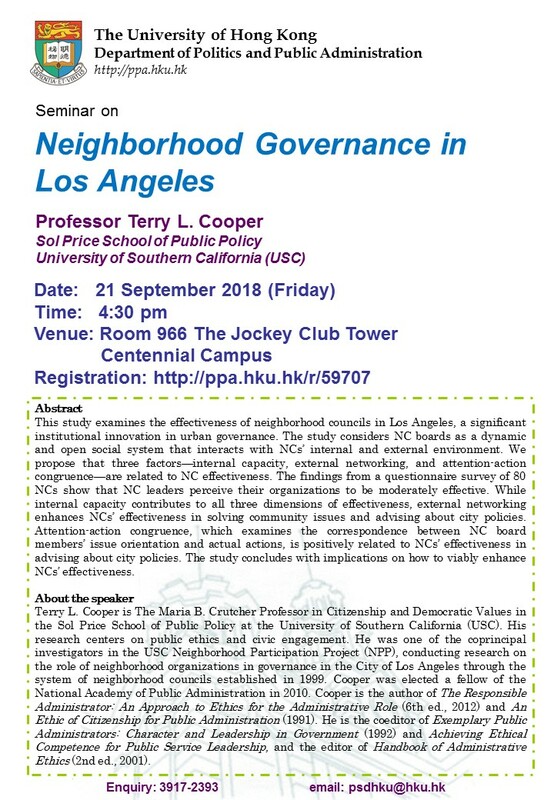 Terry L. Cooper is The Maria B. Crutcher Professor in Citizenship and Democratic Values in the Sol Price School of Public Policy at the University of Southern California (USC). His research centers on public ethics and civic engagement. He was one of the coprincipal investigators in the USC Neighborhood Participation Project (NPP), conducting research on the role of neighborhood organizations in governance in the City of Los Angeles through the system of neighborhood councils established in 1999. Cooper was elected a fellow of the National Academy of Public Administration in 2010. Cooper is the author of The Responsible Administrator: An Approach to Ethics for the Administrative Role (6th ed., 2012) and An Ethic of Citizenship for Public Administration (1991). He is the coeditor of Exemplary Public Administrators: Character and Leadership in Government (1992) and Achieving Ethical Competence for Public Service Leadership, and the editor of Handbook of Administrative Ethics (2nd ed., 2001).